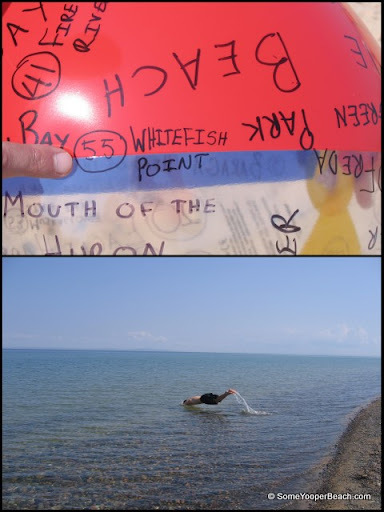 Unlike many other beaches along the eastern UP shoreline, Whitefish Point is very well known. This isn’t because of the beach, however, but because of the bird observatory. Whitefish Point is a major migratory route for birds, so most people you see here are carrying binoculars and/or cameras. In addition to the birds, Whitefish Point is known for its shipwreck museum and lighthouse. The lighthouse went into operation in 1849, and shares honors with the lighthouse at Copper Harbor as the first lights on Lake Superior. It is the oldest active light on Lake Superior. Whitefish Point has an amazing amount of history regarding shipwrecks. See below for a great excerpt!!! 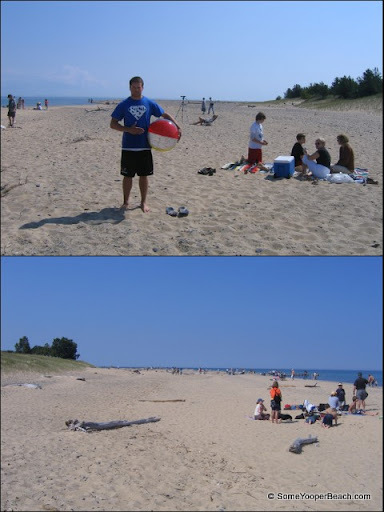 The beach at Whitefish Point is amazing too! Lots of open sand with some rocks… but a great view of Lake Superior all the way to Canada where you can see their wind farms along the shoreline. The one negative thing I would say about the beach is that it is very popular… sometimes to the point of being over crowded by bird watchers taking a break. Some people show up just for the beach, but most are there to tour the museum and see birds. Parking is an issue as well, and you may end up walking quite a ways to get to the beach, especially on the weekends. In all, though, it is a great spot – there is a reason it is so popular! Definitely a place every Yooper should check out at least once. Please be sure to read the excerpt I mentioned. It is below the next picture. Have the birds... I'll take the beach. Lake Superior’s storm of 1905 in combined terms of snow, cold, wind, shipwreck, and heavy seas, is generally agreed to be the worst ever to strike the Great Lakes. In what seemed like minutes, the temperature dropped to twelve degrees below zero and a hurricane ripped the world of fresh water apart. Thirty vessels were wrecked on Superior, some were thrown out of the water. At 4:30 pm on November 10, 1975, as the Edmund Fitzgerald struggled towards Whitefish Bay, forty-eight miles to the south, the light and the radio beacon at the remote navigational station at Whitefish Point suddenly clicked off. The Fitzgerald, already crippled by non-functioning storm damaged radar, was now without homing capability from the automated system at Whitefish. The Fitzgerald was left to fend for itself in unbelievable weather conditions. Captain McSorley, a 44 year veteran of the sea, described it: “We are taking heavy seas over our decks; it’s the worst sea I’ve ever been in”. At approximately 7:15 P.M., November 10, 1975, the 729-foot ore freighter Edmund Fitzgerald and her crew of 29 sailed into history. Each year on November 10th, there is a Memorial Service at the Whitefish Point Light Station for the crew of the Edmund Fitzgerald. The ship’s bell is rung 30 times, once for each member of the crew and one time for all mariners who have been lost at sea. This service is open to the public. First lit in 1849, the Whitefish Point Light shares honors with the lighthouse at Copper Harbor for being the first lights on Lake Superior. It stands guard over the entrance to Whitefish Bay, sometimes the only shelter to be found for a ship trying to escape the fury of the lake, and is the oldest active light on Lake Superior. While you are there too there are memorial “graves” not sure what to call them but for a few of those from the Edmund Fitzgerald. Someone told us a few of the families do it and they are very unique. Very beautiful and clean beach. And personally I think the beaches in the UP are just as beautiful as any on our coasts, cleaner and not as crowded!